Students acquiring a second language progress through five predictable stages. Reflects students' stages of language acquisition. Helps students move through the language acquisition levels. 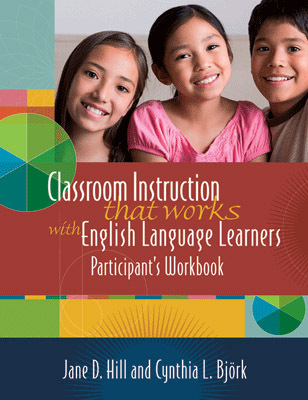 Engages ELLs at all stages of language acquisition in higher-level thinking activities. Anyone who has been around children who are learning to talk knows that the process happens in stages—first understanding, then one-word utterances, then two-word phrases, and so on. Students learning a second language move through five predictable stages: Preproduction, Early Production, Speech Emergence, Intermediate Fluency, and Advanced Fluency (Krashen & Terrell, 1983). How quickly students progress through the stages depends on many factors, including level of formal education, family background, and length of time spent in the country. It is important that you tie instruction for each student to his or her particular stage of language acquisition. Knowing this information about each student allows you to work within his or her zone of proximal development—that gap between what students can do on their own and what they can do with the help of more knowledgeable individuals (Vygotsky, 1978). Another reason for all teachers to gain insights into their students' stages of second language acquisition is to meet the requirements of the 2001 No Child Left Behind Act, which requires ELLs to progress in their content knowledge and in their English language proficiency. How are we going to accomplish this if we are not all responsible for content and language? Why should we be aware of the stages of language acquisition? What are the implications of the stages for mainstream instruction? Research shows that high levels of student engagement are "a robust predictor of student achievement and behavior in school" (Klem & Connell, 2004, p. 262). At the same time, one way for mainstream teachers to engage their ELLs more is by asking tiered questions. We recommend that teachers ask frequent questions throughout their lessons, as doing so lets ELLs practice their new language and helps teachers assess how much of the content the ELLs understand. Of course, questions should be tailored to each ELL's level of second language acquisition. Figure 2.1 summarizes the five stages of language acquisition and shows some appropriate prompts and sample questions to use for each stage of second language acquisition. By knowing the stages of language acquisition and stage-appropriate questions, you can engage students at the correct level of discourse. Asking the tiered questions that accompany the stages of acquisition is one way to help students move to the next stage. To ensure that the student is being challenged and pushed to the next level, it is important to once in a while ask questions from the next level as well. Why do you think … ? Although there may be an approximate time frame for each stage of language acquisition, the length of time students spend at each level will be as varied as the students themselves. As you can see from Figure 2.1, it is OK to ask Preproduction students "Where is … ?" or "Who has … ?" questions—that is, questions that require a pointing, drawing, or circling response. It is even OK to ask Preproduction students a question every so often that requires a one-word response, because we always want to transition them to the next stage. You can use tiered questions to include all ELLs in whole-class activities, or one on one to check comprehension or content learning. To accomplish this, you will need to know each student's stage of language acquisition. Preproduction: Ask questions that students can answer by pointing at pictures in the book ("Show me the wolf," "Where is the house?"). Early Production: Ask questions that students can answer with one or two words ("Did the brick house fall down?" "Who blew down the straw house?"). Speech Emergence: Ask "why" and "how" questions that students can answer with short sentences ("Explain why the third pig built his house out of bricks." "What does the wolf want?"). Intermediate Fluency: Ask "What would happen if …" and "Why do you think …" questions ("What would happen if the pigs outsmarted the wolf?" "Why could the wolf blow down the house made of sticks, but not the house made of bricks?"). Advanced Fluency: Ask students to retell the story, including main plot elements but leaving out unnecessary details. Turn to the sample lesson plans in Appendix 5–8 and select the one that's most appropriate for your grade level. After reading the lesson, match the sample student responses at the end to their respective stages of second language acquisition. You may be asked to share your responses with the large group. What distinguishes low-level questions from high-level ones? You likely use or recall Bloom's taxonomy (Bloom, Englehart, Furst, Hill, & Krathwohl, 1956), which provides a structure for categorizing the level of abstraction of questions. Figure 2.2 illustrates the levels in the taxonomy, starting with questions for recalling information (low level) and concluding with questions for predicting and discriminating among ideas (high level). The Ramirez study of bilingual educational programs (Ramirez, 1992) found that in all the language programs studied (including immersion and early- and late-exit transitional programs), teachers tended to ask low-level questions. In fact, in more than half of their interactions, students did not produce any oral language; when they did, they engaged in simple recall. You may ask yourself, "How can I possibly ask a Preproduction or Early Production student a high-level question if the most that student can do is point or give a one-word response?" Do not mistake an ELL's limited output for an inability to think abstractly. It's easy to keep asking Preproduction students yes/no questions or have them respond by pointing, but the students must do more than simply recall knowledge. We can't have ELLs stuck at the lowest levels of thinking. Have you ever seen the levels of thinking from Bloom's Taxonomy aligned with the stages of second language acquisition? For some reason, many people think that students in the initial stages of acquisition can only answer low-level questions, and that those in the advanced stages are more likely to answer high-level questions. However, this is not the case. As Figure 2.3 shows, the levels of thinking and the stages of second language acquisition should operate more as axes than in side-by-side alignment. Appendix 1 shows an actual matrix using both the levels of thinking and the stages of second language acquisition. English language learners at all stages of acquisition should be asked questions at all levels of thinking. We don't want them to get stuck at a knowledge level only. We want to challenge their thinking and speaking abilities. The statements on the cards for this activity in Appendix 9 are taken from a high school science class during a plant unit. The students have already acquired and integrated plant knowledge and are now ready to practice, review, and apply what they've learned. How would you engage students across all stages of second language acquisition at all levels of thinking? Place the activity cards on the most suitable space on the game board. Copyright © 2008 by Mid-continent Research for Education and Learning (McREL). All rights reserved. No part of this publication—including the drawings, graphs, illustrations, or chapters, except for brief quotations in critical reviews or articles—may be reproduced or transmitted in any form or by any means, electronic or mechanical, including photocopy, recording, or any information storage and retrieval system, without permission from ASCD.